I pride myself in maximum efficiency when it comes to loading dishwashers, so much so that I’m sure I could beat the records in those dishwasher commercials where the see how many dishes they can fit. With most new models, they can handle being jammed packed full and still be able to clean all of the dishes well, but for those of you with lower end and older models, that’s not quite true. After living with an older, less expensive model dishwasher, I’ve learned a few tricks to load the dishwasher so all of the dishes come out clean, on the first wash. Unfortunately, older and lower end dishwashers cannot handle every single dish you own in one load. 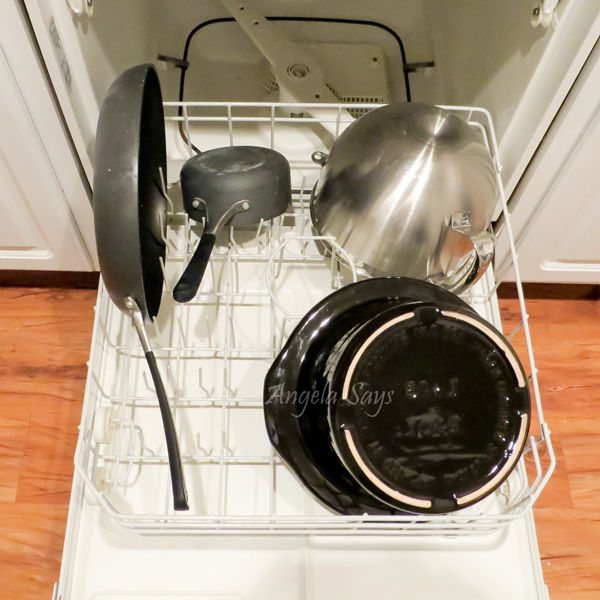 The dishwasher really does need the space between each dish to clean effectively. For a long time I figured I just needed to rinse my bowls really well to get them clean in the dishwasher. False, I just needed to provide more space in between each one to allow water and the dish detergent to do their magic. There’s about a one inch space between each bowl since I put them in every other tine. 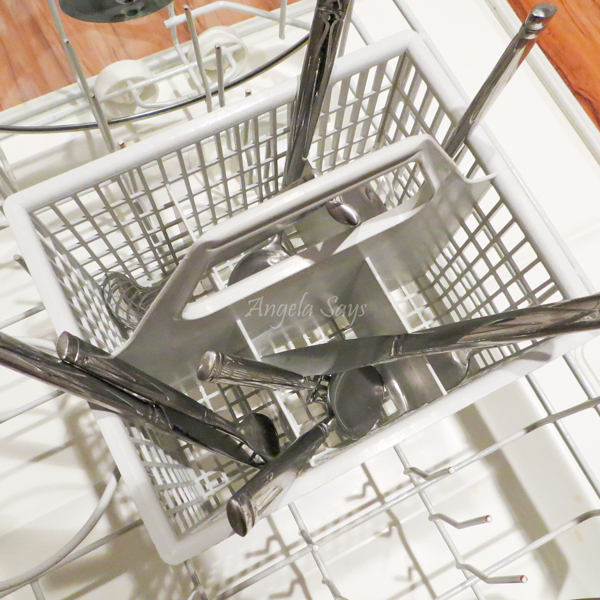 In the top rack of the dishwasher, the tines are space so that most cups, even wide-mouthed ones, will fit between the tines so you can have two rows next to each other. Typically in older and lower end models, the sprayer is in the middle and the water sprays out towards the walls of the dishwasher. With all of the dishes facing the middle, the water is able to hit the eating surface of the dish better, washing away the food you’re trying to get off. The tines are designed to encourage placing the placement of the dishes towards the middle. If you’re trying to be efficient by putting all of the spoons in one spot, forks in another and knives all by themselves, then your silverware might not get clean on the first try. Why? As these like items like to stack nicely in the drawer, the same thing will happen in the dishwasher. 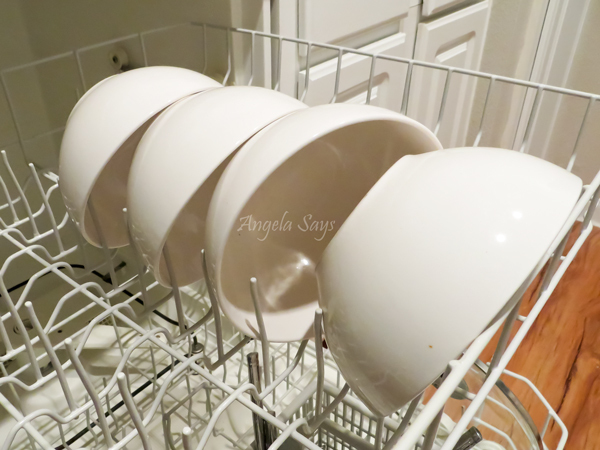 Mix the silverware together and they won’t stack so water can flow around them freely. And placing them handle up will allow you to grab them by the handle so you don’t grab and immediately dirty up the eating end. This means washing your mixing bowls, casserole dishes and large pans in their own wash. This way you can get the dishes you eat off clean first, removing the majority of the dish clutter. Plus, this allows for your big dishes to get the most amount of space and water flow around them. Potentially this can also allow you to do two loads instead of three mixed loads. Taking out the rack and placing large pots in by them selves allows for better water flow. P.S. Some pots and pans are not dishwasher safe, like mine. Don’t tell my husband, I might sometimes put them in when I don’t want to hand wash them. If you’re just washing big dishes and no silverware, take that bucket out of the dishwasher to allow you to stick another dish in or to allow the existing dishes a little extra room. 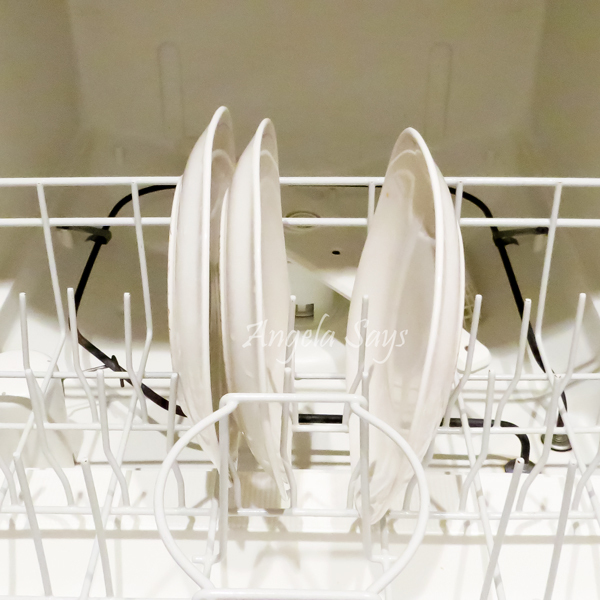 These tips took me a while to assemble as I became frustrated with the state of my dishes, but now they come out sparkling clean every time. A few other tips to make you dishes come out clean on the first try is to clean your dishwasher periodically, food and grime build up can stop your dishwasher from cleaning efficiently. I would also make sure you are using the right kind of detergent for your dishwasher, some liquid detergents can clog certain machines and others require the tablets only. 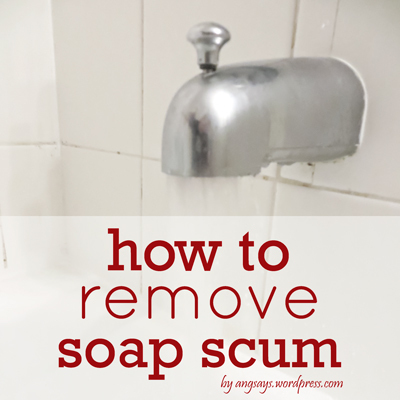 Check your user manual for your machines specific soap requirements. Great tips Angela – I’m passing this onto my family. Finger’s crossed they listen! Thanks Marie! I hope they listen too! Hi, Angela! Great tips! I’ve also found that using less detergent helps a bunch. I use one to two tablespoons in the regular cup, depending on the load, and about a teaspoon of detergent in the extra cup. Dishes come out clean without the cloudy spots. Hope your new year is going beautifully! Yes, I usually try to do that too. We had a repair guy tell us that we really only need to use about a tablespoon so I kindly remind my family to not fill up the cup all of the way. Thanks for stopping by Lillace! Thanks, Angela! Have a great week! What a great post!! I just printed this out and gave to my oldest (who’s job it is to fill the dishwasher). I am not the only one that has to fill it a certain way. The only thing that I do differently, is that I wash my silver eating side up. This way nothing can get trapped in the tub where we will be putting it in our mouths. HOWEVER, my silver is in the door, and has a flip down side, so you still pick it up by the handle. Thank you! I’m quite flattered that you printed this out for your oldest child. I put some of my large mixing spoons in with the silverware and put them handle down, because that’s the only way they’ll fit and I want to make sure all of the dead food is removed. you are brilliant … I KNEW the cups were supposed to go between the tines – you will help me win the ongoing dispute! don’t you think the people who design dishes and the people who design dishwashers should consult each other periodically?!? Me and the husband always argue on this. great tips now i can prove i’m right. Thanks for sharing at The Weekend Retreat! 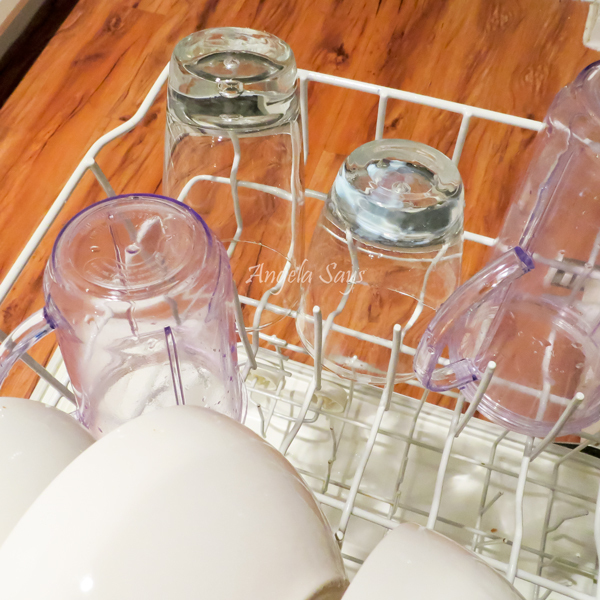 Each dishwasher is a little different and the lower end ones especially need these tips. Thanks so much for stopping by! 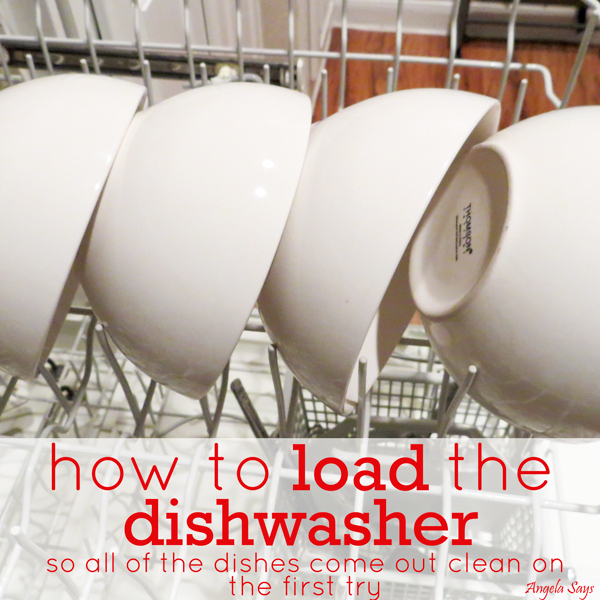 You’d never believe how many people are loading the dishwasher the wrong way! I get emails every week from people asking why their dishwasher is inefficient – and this is 90% of the times the cause (improper loading). Loading the dishes is a very important task in the dishwasher. If you didn’t load the dishes in the washer properly it will harm your dishwasher badly.